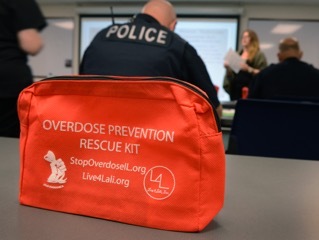 Live4Lali is committed to expanding overdose prevention and harm reduction efforts to law enforcement agencies across Illinois and surrounding states with active Drug Overdose Prevention policies, enabling Naloxone to be administered in the event of an overdose. Our program is certified by the Illinois Department of Alcohol and Substance Abuse for training on intramuscular (needle and auto-injectable) and intranasal versions. Why should you implement this program at your agency? First responders such as law enforcement and EMS are the first to arrive at the scene of an overdose. Because overdose is a medical emergency, time is of the essence. Many law enforcement officers are already trained in using AEDs (automated external defibrillators) or in administering CPR (cardiopulmonary resuscitation). Adding naloxone to their set of tools will help save lives. 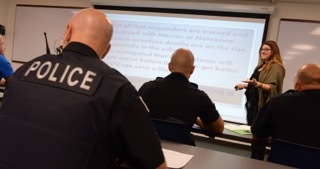 Trainings for police departments are cost effective and simple to set up and execute. Our two-hour trainings provide your personnel with a robust educational experience for a more effective approach to recognizing and responding to an opioid overdose.